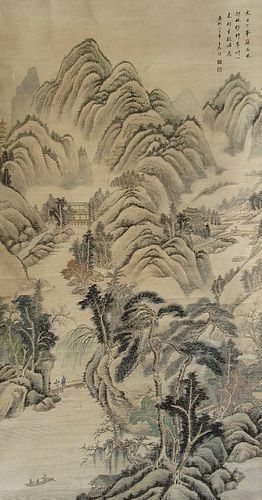 Antique Japanese scroll painting on silk, of a lone black bird perched on a blossoming branch. Signed Tan Yen, with chop. 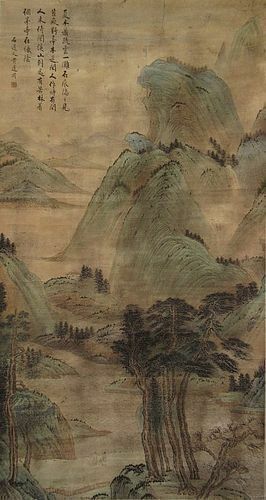 Antique Japanese scroll painting of a young woman with a younger girl , dressed in beautiful flowing kimono and standing below a cherry blossom branch. There are three chops altogether, one is of a very unusual shape of a vase. Beautiful calligraphy along the upper region with artist's signature below in corner. Tomobako is included. 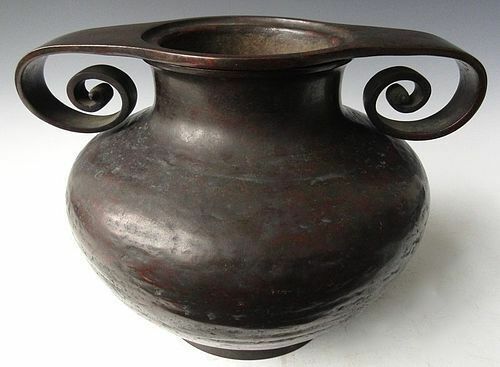 Antique Japanese bronze ikebana vase, meant for artistic flower arranging, with unusual curling handles reminiscent of spiraling vines. Artist's signature incised in the bottom. 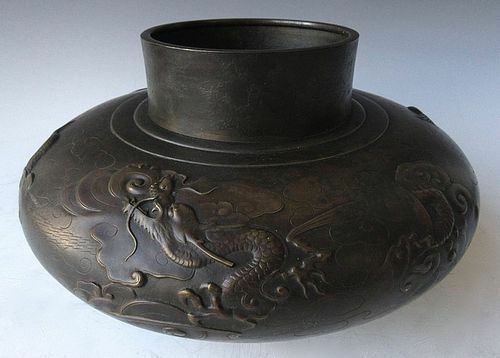 Antique Japanese bronze vase, of wide, round, and shortened form, its edges sculpted with dragons flying through clouds. Beautiful original aged patina. 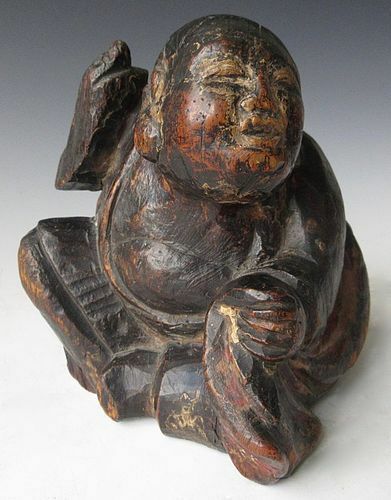 Antique Japanese wood carving of Hotei, one of the Seven Lucky Gods of fortune, with beautiful remnants of old lacquer. 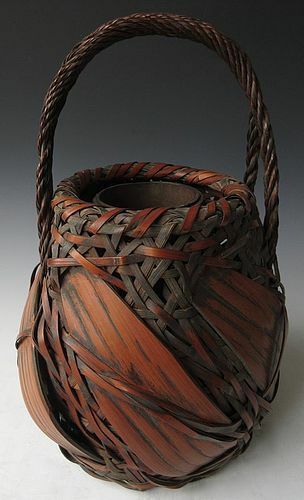 Antique Japanese ikebana basket made of woven bamboo, with large strips of bamboo interwoven with a network of thinner strips, and a tightly twisted handle. The inner vase is a large section of bamboo lined with metal. 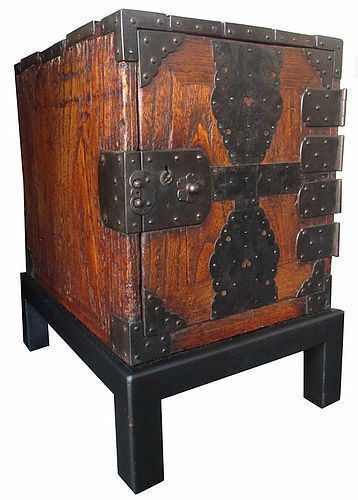 Antique Japanese fune tansu (ship safe chest) made all of quartered sawn cut Keyaki (elm) wood with revealing natural woodgrain and finish. 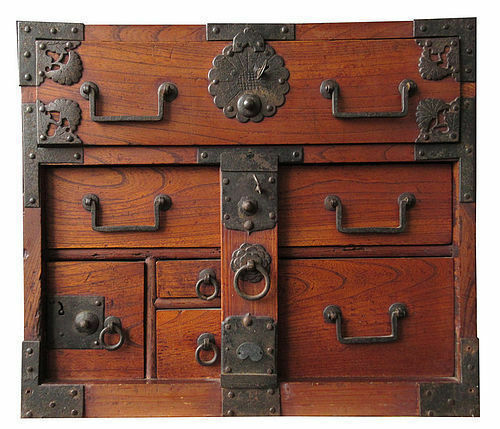 Cut out appliqué hardware with incised floral motifs adorns the body of the tansu. There are six drawers altogether.